This very interesting surname is of Anglo-Saxon origin, and has a number of distinct derivations. Firstly, it may represent the surname developed from the Middle English personal name "Alstan", which is itself the result of a coalescence of various Olde English personal names: "Aethelstan", "Aelystan", "Ealdstan", and "Eahlstan". These compound names all share the same second element, the Olde English pre 7th century "stan", stone, and have as the first element, respectively, "aethel", noble, "aelf", elf, "eald", old, and "eahl", shrine, temple. The surname from the medieval "Alstan" is first recorded in the Cambridgeshire Hundred Rolls of 1279 as in Henry Alston. 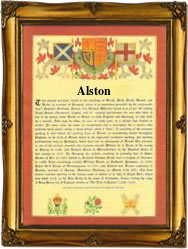 Secondly, the modern surname Alston may be of locational origin, from any of the various places called Alston in Lancashire, Devonshire and Somerset, or Alstone in Gloucestershire and Staffordshire. These are variously named with the Olde English personal names "Aelfwine", elf-friend, "Aelfsige", elf-victory, "Aethelnoth", noble-daring, and "Aelfred", elf-counsel, and the Olde English "tun", settlement. The first recording of the surname, below, is a locational name, and other early examples include: William de Alsiston (1221, Worcestershire), John de Alnethestan (1230 Devonshire), and Roger de Alleston (1246 Lancashire). The marriage of William Alston and Elizabeth Dennis was recorded at St. Bride's, Fleet Street, London, on August 21st 1656. An early Coat of Arms granted to the family depicts ten gold estoiles, four, three, two and one, on a blue shield. The first recorded spelling of the family name is shown to be that of Richard de Aluredeston, which was dated 1194, in the Staffordshire Pipe Rolls, during the reign of Richard 1, known as "Richard the Lionheart", 1189 - 1199. Surnames became necessary when governments introduced personal taxation. In England this was known as Poll Tax. Throughout the centuries, surnames in every country have continued to "develop" often leading to astonishing variants of the original spelling.